Internal screens and glazed walls are the latest designer addition for homes and offices. The partitioning glazed walls are constructed from steel to form a network of glazed panels that can be customised for any home or office, creating light and space. These beautiful room dividers are much slimmer than a standard interior wall, yet just as strong and durable with its steel framework and toughened glazed panels. Come and visit our Bristol Showroom to discuss how these beautiful glazed walls and screens can enhance your home or office. Contact us today. Create better views with internal screens from Crittall. Their W20 Inner Versions brand provides incredibly slim sightlines; each product is single glazed. You’ll be able to let more light into your home and enjoy better views with this market-leading option. The internal screens that form part of Crittall’s W20 Inner Visions range are perfect for opening up spaces. Whether you want to continue the traditional aesthetics of your Bristol home or create an industrial effect for an office, you’ll be able to achieve your design aims. This particular product line is also very structurally powerful thanks to the hot-dip galvanisation of the materials within. This is further improved with a factory-applied Duralife polyester power coat finish that offers weather-resistance. We also utilise the fantastic Slimline Aluminium profile, an industry-leading framework that offers you all of the benefits of contemporary double glazing. This line is sturdily built with internally or externally beaded windows dependant on your preference. We incorporate the latest in aluminium polyamide materials in the manufacturing process of our fantastic Slimline Aluminium products. Working in tandem with the vacuum-sealing technology characteristic of modern double glazing, these products are Secured by Design. One of the most engaging aspects of these products lies within their sound-reduction properties. The perfect choice for those wanting a little more privacy, the Slimline Aluminium profile excels at reducing noise pollution from both the inside and out. Create stunning open plan spaces with our range of internal screens from Crittall. You’ll be able to divide your room into sections that form different functions but without them feeling disconnected due to an absence of light. The fine construction of these internal screens – which are made from steel for added strength – can be used with single or double doors. You’ll be able to enjoy a decorative feature that won’t obstruct access to your Bristol home. To find out how our Crittall W20 internal screens could add value to your home or office in Bristol, please contact us. Are you looking for internal aluminium screens? Panoramic can offer a stunning product range that will ensure you meet your design objectives in full. Our internal screens are double glazed and made from aluminium. You’ll be able to enjoy a warm and comfortable environment and almost unimpeded views. The double glazing in your installation will work with other features to limit noise. Our internal aluminium screens are ideal for homes or businesses located in built-up areas. 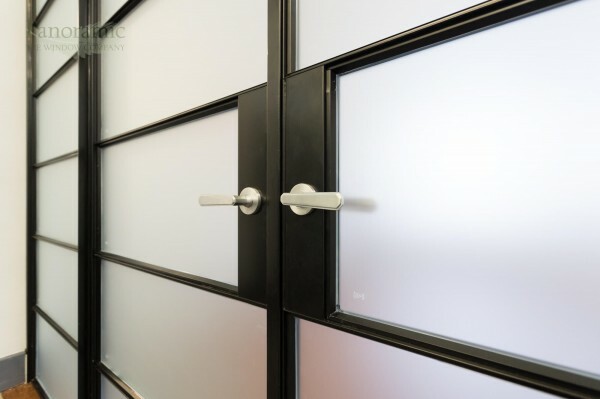 Our internal aluminium screens can be used for a variety of purposes, which means we’ll be able to meet the demands of your project. To discuss the advantages of using internal screens as part of your commercial or residential project in Bristol or Bath, please contact us. For more information about our aluminium or steel internal screens, please call us on 01179 560321. You can also send us a message to request a callback. You can view our products at our dedicated showroom. Call us or use our online booking form to arrange a visit – or to ask us to come and see you. Do you need internal screens and more for your project? If so, please use our design tool to build your products online. "Panoramic have fitted Crittall windows in our property over a period of time to fit in with a staged plane to replace all our old steel windows. They have consistently performed to the highest level and the overall effect of the new double glazed windows is exceptional."